Appleoosa – Street’s outside sheriff’s office. 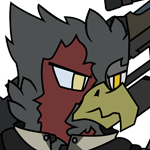 The griffon holstered his rifle as he sauntered over to Silvershine, using a talon to lift up the thick, metal visor to his helmet. He listened to the mare continue to speak as he plucked his earnings from her hoof. A 'job well done' would one of the last phrases Kroll would've used to describe the assignment, but he could care less now that his client was satisfied and his pay was firmly in claw. "Kroll, New-boss. That is how I am called." he replied with a hint of exhaustion as he leaned up against the wall next to Silvershine, fishing out a crumpled package of stale licorice from a pouch on his armor. The tercel slid end of a piece into his beak before holding out the packet to Silvershine. "Mm?" he offered, shaking the package's contents a little. Longshot wasn't very happy about only being able to give the belongings a cursory examination; anything could be hiding in all that junk. He sighed as he gathered it up, but he could leave it to the ponies who's job it actaully was. He passed the lump of cloth and metal off to one of the deputies then, hearing himself be introduced, joined the conversation by sitting nearby, taking a lenth of the offered licorice. "Thanks. You look pretty exhausted there, Kroll," he said, taking a bite. "Haven't been sleeping?" Kroll frowned as Longshot helped himself to the tercel's supply of candy, the muscles on the right side of his face not moving as much as the ones on his left, due to the heavy scarring there. "Sleep is a luxury for those that have no work." he said flatly, narrowing his eyes at the unicorn as he snatched up the crumpled package and stuffed it back in one of his armor's pouches after Silvershine took a piece. The mercenary crossed his arms as he listened to his employer talk, his tail tapping slowly against the office's wooden floor. It seemed like the mare still had use for him by the sound of it, and as much as Kroll loathed the town he had been stranded in, working for this pony seemed like the most promising source of a steady income for the time being. After stepping inside, until the door closed behind her cell door, Blondie was taking mental notes of everything. It had been planned for the mafia to canvas the place on their own time for if there were ever any scenarios that one of them was landed here, but she might as well do it now while she was there. The new Sheriff, Marshal Law she recalled from the data they had collected, stuck out in particular to her. Silverstar was the straightest shooter back in the day, in all sense of the word, so Blondie's Mafia never really had a hoof in Appleoosa. Although that was the case, Blondie still held Silverstar with high regard with how quick he stuck to his values, that she even sent flowers to his funeral. Anonymously of course. Now, I wonder if Law will uphold his sense of justice as strong as his predecessor... She thought as she sat down on the cot, which she noted as being rather cozy thanks to it's relative newness. Or if we'll break him as easily as we've done with many others like him? However the moment the mare had taken a seat, she felt antsy. There was time to kill until she could talk to proper ponies, and she didn't want to waste any of it entertaining herself in any mundane way. So she trotted over to the door, and poked her head out the little window that was there for the guards to check up on their guests. "I'm assuming that I'm not allowed to ask any questions, am I?" Blondie said rather playfully. "But any questions you may ask about me, I think I'd prefer it if I could answer them. Better to hear it straight from the horse's mouth, rather than some second hand information that may have been fed by a random vagrant or one of my employees." "I'll guarantee you that regardless of the source, what you'll have found out will be equally as garbage." She added with a smile. Concern wracked Frost's brain, half of her wanted to stay here and do as she was told but the other half not so much. She hated doing nothing, it was something she had always been unable to do. Moving away from the princess and back to her family, the pegasus leaned close to her sister, keeping her voice low. "Psst, sis, come on we should see what's causing all this racket, maybe we can help out in some way? I don't know, better than just standing her doing nothing." Prism had tried to keep her focus on the speeches and the formal events of the ceremony. The flare and distant noise was concerning, but she was a society pony who's parents happened to have worked in the war, she had no ability to solve a conflict involving explosions, there must be guards around to do that. So she kept her calm, but her sister's nudge raised her curiosity anew. "I suppose at this point it wouldn't hurt too much to at least take a peak at what's going on, but are you sure we're the best ponies for the job?" Iris stroked her horn across her flank, shining it as she waited for the legal procedures to take place at the sheriff's office. She knew there were rules that had to be followed with bookings, but she normally avoided being around while said rules were being followed, they were dreadfully boring. "Sleep is necessary between work for the best work to be done. Though I prefer to rest during the boring bits of work, like this right here. At least it seems that I've fallen in with a somewhat interesting group this time." Longshot nodded, agreeing by and large with Iris' comment but wanting to take the conversation in a different direction. "I've seen plenty of folks put off rest for work that matters to them, but I've got the feeling that you didn't exactly care about the job. Is money that important to you?" The tercel scowled. "Supplies do not come without cost, Equestrian. As with munitions and food." he said flatly, irked by the stallion's line of questioning. "Like a round circle is the way it goes: money for supplies, supplies for work, work for money; the more of one, so may the others follow...such is the theory for that way." Kroll concluded with a huff, looking away for a moment as he continued gnawing on his piece of licorice. "Had not the money's worth of your country been far greater than that of my own, I'd be elsewhere than here, and gladly so." he added, glancing back spitefully at Longshot. Last edited by Kroll on Mon Oct 19, 2015 10:12 pm, edited 1 time in total. It greatly irked the mare that nobody had really paid any mind to her little comment, clearly showing that they were ignoring her. Normally it'd be a perfect time to probably do something about her situation, and make a speedy getaway, but she was there for a reason. However she was still bored, and there was a conversation going on that apparently she was being excluded out of, so she just listened until deciding to pipe up a comment or two. "My my, the merc is so cold. Always about the money." She quipped, leaning comfortably on the cell door. "And the 'Equestrian', you don't bother learning his name I noticed, is just trying to be amicable. A bit of small talk doesn't hurt with the amount of bits Silvershine had slapped in your claws." The mafioso directed her next comment to Silvershine. "See, this is why I don't usually outsource. Creates terrible workplace cohesion. Not to mention the necessity for sensitivity training, Ugh! Just so much of a hassle." "Although..." Blondie had a bit of a sneer on her face. "It certainly is cheaper, isn't it?" Longshot rolled his eyes at the acknowledgement of the prisoner. Already she was trying to mess with them. Probably wasn't part of her plan, just being oppurtunistic. Still, while he could ignore the scum, it wouldn't do to ignore Silver. "I sort of figured this wasn't a short term issue, hence my question. Just trying to get a sense for where he stands. Trisha used to be a lot like this. Tartarus, I used to be a lot like this." He turned back to the merc, addressing him directly again. "Though, as one who's been there, let me offer some personal advice. You can always just ignore it. Money, supplies, jobs; there's always some way to come by those. If you're risking your health... well, there's more important things to do it for than something so transient." Amused, Blondie snorted and pretended to wince. "Ouch, score one for the law. Although I'm fairly certain usually ponies are smart enough to not steal one of the Elements of Harmony right from under the nose of a well known Mustang Magus. Unless you're as desperate as that one pegasus who was practically on leash to the Canterlot Branch, there really isn't anything good that could come out of it." Briefly noting to herself to probably go about educating her 'employees' about current politics. "How is your father anyhow? Dark and Brooding as usual? Fixed up things with Angelblade at all? And how is that odd stallion in Canterlot? Erm... the name escapes me, runs a toy shop? I believe you were in a relationship at some point?" She frowned, struggling to recall. The mafioso sounded almost like a distant aunt at this point. "Hm, I'm afraid I'm a little behind on the times. Missing too much of the juicy details. Anywho..."
A glint of intrigue in her eyes, Blondie turned her attention to the mysterious pony that she had no data on, nor could any of the Rats find anything on. with genuine curiosity in her voice, she asked "So who is this Trisha? Certainly doesn't sound like a normal Equestrian name. Family? Sibling? ...A lost love?" Kroll cast his eyes towards the floor as he begrudgingly listened to the Longshot's response, occasionally casting him a sideways glance as he spoke. As much as the mercenary hated to admit it, the stallion did have a point; maybe once this was all over he could take a short reprieve before looking for contracts again. Still, that would be a ways off judging how Silvershine described what lay ahead, and this quick break was sufficient enough for the tercel to collect himself for the time being. Pushing himself off the wall, the griffon lowered his helmet's metal faceshield with an audible 'clunk' before turning to face his employer. "Difficulties such as those will not move me from your side, New-boss." he said with a nod, glancing back at Longshot again for a moment before looking back at the mare before him. "Whatever must happen to get this done, I am ready to do." Longshot visibly bristled. Though he was glad for Kroll's response, Blondie had something much more important. "Excuse me? You stole an Element of Harmony? Why?!" I told you the package was important. Longshot's anger spiked when he realized Fire had told him that knowing he wouldn't listen to it. Then he tried to get that anger under control before he fed it further, but it don't stop the laughter ringing in his head. He set it aside to deal with later, instead focusing on the criminal. Her ears drooping Silver shakes her head, “Yeah and try not to yell that too loudly. I’ve no idea how ponies want to play this yet.” Looking to Kroll she nods, “One of you three keep an eye on Blondie, the others get some rest. Soon as Princess Celestia and the others get here things are going to move fast.” As if on cue a pair of the Royal Guard entered with her uncle Breaker. Longshot shook his head and sighed. "Obviously we need to recover the element, and as quickly as possible. A trade would be simplist, but the question is can we trust the mob boss to keep her word? I'm not flatly stating we can't trust her, mind. I'm asking this legitimately since I know very little about her. Only that I've been burned trusting the head of a group like this before." "Well, I'm glad I'm talking to someone who finally has a sensible head on his shoulders." Blondie said cheerily, now comfortably seated. But her expression turned more serious, almost insulted as she turned to sternly address Longshot. "And my dear, I'm a little hurt. I can tell you have experience dealing with... company's like mine, but I can assure you that a smarter employer would know which deals are safer to stick to agreements, and which ones to cut off. This one being former, as I can only see needless bloodshed if we decided to keep the Element." "Again, your Highness, Miss Sparkle, terribly sorry about the misunderstanding." The mafioso said with 100% honesty. "For everything that had happened today. I'm afraid most of my employees are not entirely up to date to current events ever since we disappeared from the War." She cleared her throat, standing to her hooves. "Now then, shall we start discussing terms and agreements then? Seeing as we're exchanging one of your most valuable assets for our most valuable assets, it would do well if we had guidelines to follow." It had been a boring afternoon for Iris once the capture was made. She skipped some of the negotiations to check in on her sister and get the filly some sweets in exchange for missing the party that she was assured was boring and that getting the whole hotel to her self was sure to be much more exciting. Iris had no clue why her mother had sent Sugar away, but didn't probe too much, her mother always was paranoid about her tiny sister's safety. After a quick dinner with her sister Iris returned to the jail where the princesses were meeting with Blondie as well as some other PSA agents. "I think I can help with keeping up Blondie's end of the bargain" she said, pulling a small vial out of her bag that held something about the size of a grain of rice that looked similar to a bullet. She pilled out another tiny vial and dropped the pill from the first bottle into the liquid contained in it "This capsule contains one of the strongest poisons known to pony kind, but don't worry, it's casing is incredibly strong and will only burst if triggered by the spell I've placed on it. It's coated in an anesthetic so you won't even know where to tell your clever scientist to find it. Come back with the element within 24 hours or I signal the pill to burst." she said before looking to the princesses. "That is unless the Princesses would prefer a different safeguard."